BRIDGEWATER High’s grade 10 students celebrated the completion of four years of high school at their leavers’ dinner at the Hilltop Granton at the end of last year. 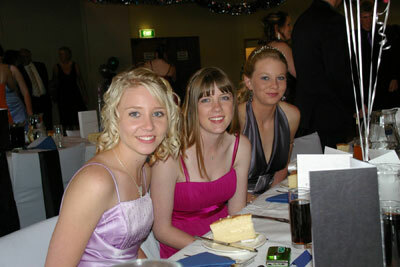 Looking stunning: Stacey Nichols, Samantha Knight and Lauren Free. THE Federal Government’s recent approval of $10.5 million to start work on the $164-million Brighton Bypass this April has been a welcome announcement for the community. However, the Brighton Council had already begun the process of planning to revitalise the town centre long before the official announcement was made. Brighton Council has commissioned Tasmanian environmental planning and landscape architecture firm Inspiring Place Pty Ltd to look at ways of improving the general appearance, accessibility, safety and functionality of the Brighton town centre along the Midlands Highway between Elderslie Road in the south and Pontville to the north. THE ever-popular Brighton Market, which runs on the first Sunday of every month, is combining other popular events such as Speed Art and Miniature Pony judging in coming months. THREE joint ventures have tendered for the $243-million Brighton Bypass and Transport Hub when tenders closed recently. Minister for Infrastructure, Graeme Sturges, said the projects were vital components of joint Tasmanian-Australian Government plans to upgrade the northern approaches to Hobart. BRIDGEWATER/Brighton Learning Federation manager Andrew Bennett certainly has his work cut out. Just a month into his new job of overseeing the recommendations of the Bridgewater and Southern Midlands Educational Renewal Taskforce [BASMERT] taskforce, Andrew has established some key priorities for ensuring that the revolutionary educational concept becomes reality, sooner rather than later. ONE of the most challenging roles for local government councillors involves making decisions on planning applications for the use and or development of land. Most people would be aware that under the Local Government Act the main functions of elected councillors are to represent the community, to act in the best interests of the community and to undertake duties and responsibilities as authorised by council. BRIGHTON Agricultural Society’s first truck and ute competition, in conjunction with a music show, will be held at the Pontville Recreation Ground on Sunday, March 8. As well as competition classes for all types of trucks and utes, there will be a wide range of vehicles and machinery on display. Food and refreshments will also be available. The Brighton Football Club will have its facilities open for those wanting some liquid refreshments with profits used in the community. YOGI’S Boxing Classes have begun at the Poultry Shed Pavilion (new shed just past the Pontville cricket and footy ovals). The classes train four nights a week (Mondays to Thursdays), from 6pm – 7.30pm with children from 10 years old and upwards invited to join. Younger children (10-16) can attend earlier classes on these days from 5-6pm. HOBART United Football Club, which is an incorporated not-for-profit organisation founded seven years ago, is going from strength to strength. This year the club will field a number of teams: men’s div 1, men’s div 1 reserve, women’s div 2, boys under-13s [existing] and new in 2009 women’s div 1, youth under-18s and girls under-14s. Through football, renowned as ‘the world game’ (more commonly known as soccer), the club promotes friendship and builds racial harmony, peace and social integration across communities within Hobart and Brighton areas.